Happy day after Thanksgiving or should I say Happy Black Friday! I hope the day went well yesterday and that you all got to spend it with your favourite people. Of course it was a normal working day for me, but I did enjoy looking at all the yummy Thanksgiving-ness on Instagram. So much good food. 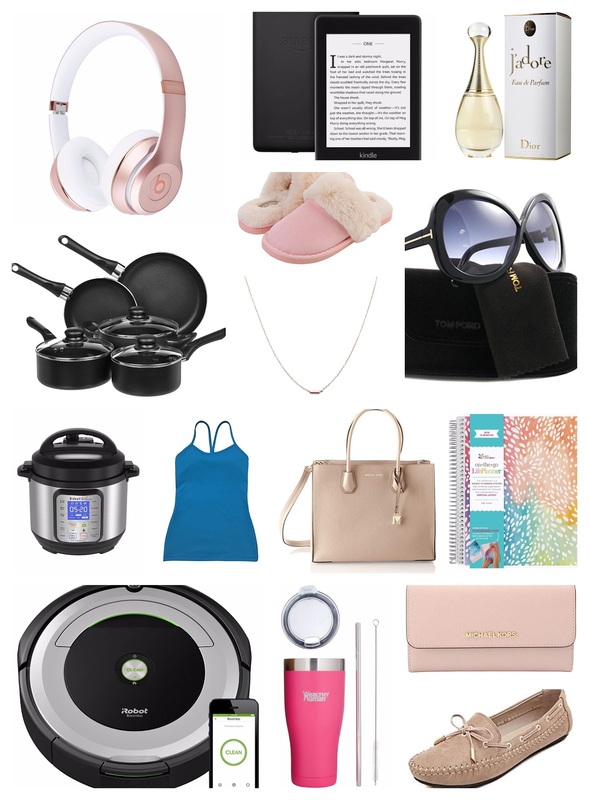 Anyway, as its Black Friday I’m pumped to post my second gift guide, this one for the females in your life (my first gift guide was for travellers). So much of it is on sale! Im jumping right into the goodies. 1. Tumbler – Any woman would love a good tumbler and its the perfect gift for a friend, sibling or even girlfriend. I have this tumbler and love it – keeps drinks cold or hot and the best part is it comes with an aluminium straw and the straw cleaner. 2. Sunglasses – Danny bought me these for my birthday, but these Tom Ford sunnies (pictured) are also super cute and chic and I love it. I have an obsession with sunglasses though so it will likely be on any list I ever make ha! 3. Stationary – I love stationary and planners. Im currently using an Erin Condren planner and have been since maybe June/July. If you purchase through this link you can get $10 off your purchase (and I get $10 credit). You can also get the unpersonalised planner for a bit cheaper on Amazon. 4. Slippers – I love these cute slip on slippers. I have a similar pair that I bought when I spent Christmas in Europe last year and they are so comfortable. 5. Jewellry – I love an understated dainty necklace and this one is so cute and at a very reasonable price point. 6. Books – Apart from the kindle being a perfect gift you can also choose to purchase some books for the special women in your life. Personally, books make the best gifts! PS the kindle is $40 dollars off right now for the Black Friday sale! 7. Headphones – This was on my last list but I’m obsessed with these headphones that were on last years Christmas wish list. For a more inconspicuous look airpods are a great gift too. 9. Handbag – I love MK handbags because they look high end without a super high end price. I wouldn’t say they’re cheap but reasonable enough and both my MK bags have lasted years. This one is so pretty and I may purchase it myself. 10. Wallet – Speaking of MK they have the best wallets, like this one. I actually own and love this wallet. It’s the perfect gift. 11. Kitchenware – I’m in the market for a new pot set. This is more for the home but this is a beautiful set and is on super sale for for Black Friday. 13. IRobot Roomba vacuum – So, maybe this one is on the list because I want it but the IRobot Roomba is the perfect gift for any woman and/or household (frankly my husband probably wants it more than I do – as it should be lol). 14. InstantPot – Guys the InstantPot is also on super sale right now for Black Friday. Im grabbing it. 15. Loafers – This was on my last list as well, but I just cant get enough of these loafers. Super cute and chic, reasonably priced and the most comfortable shoes. Are you putting up your tree this weekend or is it already up?